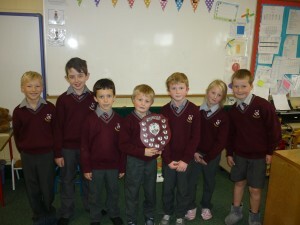 Well done to the Under 6’s Football Team who bet Bunclody and received an impressive trophy for their efforts. Well done to all involved. G.A.A. resumes this term with thanks to Jim Cooper, Jim Hanrahan and Keith Murphy. Congratulations to all the 5th and 6th class pupils who were part of the victorious Rackard League Football Team. The team defeated Oulart in the Enniscorthy District Final yesterday on a scoreline of 3-7 to 1-2. Padraig Waters (1-2) had a great game, getting vital scores in the first half when there was very little between the teams. Ryan Purcell used his height to his advantage at full forward, making things very difficult for the Oulart full back line. Danny Fitzhenry was very influential at midfield, supplying great balls into the forwards. Dylan Purcell, David Nolan and Noel Cowman were powerful in the backs throughout the 50 minutes. James Aylward was introduced towards the end and made his mark on the game. Kiltealy players: Ryan Purcell, Padraig Waters, Danny Fitzhenry, David Nolan, Dylan Purcell, Noel Cowman, James Aylward, Jacques Neville and Cillian Hanrahan all made appearances on the team throughout the league campaign. The team now go on to contest the county semi-final which will be played after the mid-term break. Well done to the boys for getting this far in the league. We are very proud of their success and we will be out again in numbers to support them on their quest to the final. Coaching continues weekly in Kiltealy N.S. Our 5th & 6th class girls played their first Rackard League mini 7’s football final in St Patricks Park on Wednesday 15th April against Horeswood N.S. The girls as always , played their best and showed determination throughout the entire game. We were sadly defeated by Horeswood with a final score of 1-6 to 2 points. However the girls should be extremely proud of themselves as are we. There were 46 teams at the start of the Mini 7’s league and only 2 teams made it to the final , which is a tremendous achievement for both teams. The girls were presented with a silver medal for reaching the finals. We would also like to thank all those who came to support the girls on the night. There will be hurling coaching from 1st class to 6th every Monday until further notice. 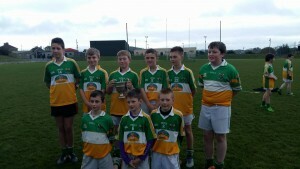 Mini 7’s County Final – Here we Come!!!! Our 5th & 6th class girls will be playing the mini 7’s football final against Horeswood this Wednesday, 15th April in St Patricks Park, Enniscorthy at 6:15 pm. The girls have worked extremely hard to get to the final and we are very proud of them. 5th & 6th class girls played their neighbouring school Ballindaggin in the mini-7’s semi-final this afternoon in Coolree pitch. Both teams gave an absolutely fantastic performance from the very second the whistle blew to the extent that we had to go into extra time not once, but twice! In the last few minutes of the game Kiltealy managed to get 3 more points , making them the overall winners of today’s semi-final. Both teams should be extremely proud of themselves as they really portrayed high levels of skill and determination throughout the entire game. We would like to thank all the parents, friends and classmates who came to cheer us on. We are due to play Horeswood in the final after Easter, and will keep you all updated of the date and time. This is a fantastic achievement for the girls and we hope they have a very well deserved break during the Easter holidays. Allianz Cumann na mBunscol Mini 7’s Football commenced at the start of March where both girls and boys from primary schools all over Ireland played against teams from other schools in their county. Kiltealy N.S girl’s football team have had huge success in the past couple of weeks , winning numerous games and are now in the semi final against our neighbours…..Ballindaggin N.S! This match will take place on Wednesday 25th of March at 3:30 pm in Coolree pitch. This is a great achievement for our girls football team and we would like to welcome their family and friends to come and support them in their semi final on Wednesday. 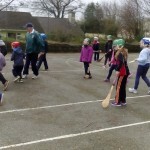 Kiltealy National School is currently taking part in the new Hurling 365 initiative. This initiative aims to promote and develop hurling skills among our children. Each school taking part, receives additional coaching from the local club immediately before, after or during school hours. Coaches from the Duffry Rover’s club provide this additional coaching to children from 1st to 6th class on Mondays. More information is available on the Wexford GAA website. 5th & 6th boys will be taking part in the Mini Sevens Hurling and the girls will be taking part in the Mini Sevens Football. Ms Kerri Dunne and Mr Noel Fitzhenry will be involved in training both teams. 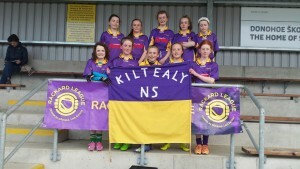 Hard luck to our Rackard League Camoige team who were defeated by Piercestown on Monday. The girls did great to get to the semi-finals in Division A , well done for this achievement. 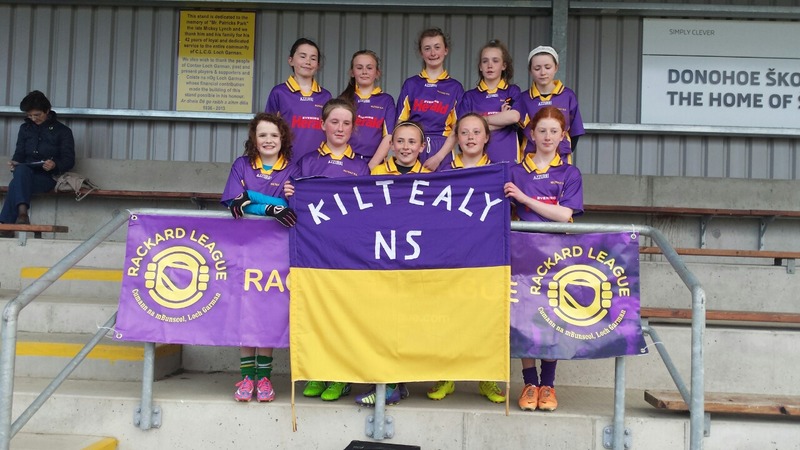 The Rackard League Camoige team had made it through to the semi- finals in Division A. They lost to Rathnure on Monday but came back with more determination today when they were up against Glynn. They had a good win with a final scoreline of 3-1 to 1-1. Well done girls. The semi final will take place next Monday ( 26th) against Piercestown in Killurin at 4:30pm. All support is welcomed. This year our camogie girls are playing in Roinn A Rackard League. Mrs Duff accompanied the girls to Piercestown last Wednesday where they played their first match. They put in a great effort from start to finish, however, they were defeated on a score- line of 6-2 to 1-1. This week the girls were given a walk over by Rathangan and will play their next match against Oulart after the Easter Holidays. A HUGE CONGRATULATIONS to the girls football team who won the Rackard League County Final on Tuesday 12th of November in St Patrick’s Park Enniscorthy. The girls played Kilanerin in the final and won by 1 point with a final score of 2-2 to Ballindaggin and 1-4 to Killanerin. Both teams gave an outstanding performance and their determination to win was evident throughout the entire match. This is a particularly special win for the girls as it is the first time that Ballindaggin has won the Rackard League County Final….and we hope it won’t be the last!! There were 6 girls from 5th class in Kiltealy NS playing in the final; Katie Bates, Kerri Doyle, Katie Breen Sherlock, Breda Cushen, Leah Fitzhenry and Katelyn Cowman…well done to you all! 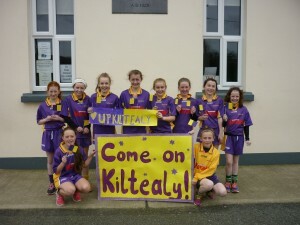 The girls were presented with their medals at the Duffry Rovers Cóiste na nÓg ceremony in Kiltealy Hall on Friday 15th. The girls are still beaming from their well deserved win! We hope to see the cup very soon! The District C finals took place before the Halloween break. Unfortunately the boy’s football team lost to Davidstown , however they performed very well and were very unlucky. The girl’s football team however had better luck winning the final against Ramsgrange. The score was 5-4 to 3-6 to Ballindaggin. They are now in the Semi Final’s against Bunclody. This match is due to take place tomorrow in St Patrick’s Park Enniscorthy at 2pm. The girl’s welcome your support and we wish them all the very best of luck. 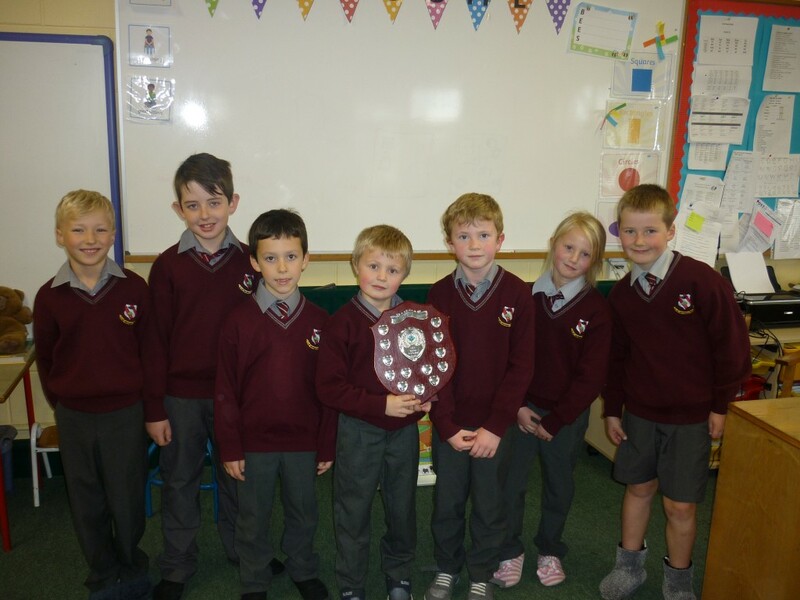 The boys and girls Rackard League football teams have been extremely successful this year and have made it into the Roinn C District Football Finals. In Kiltealy N.S we have boys from 4th – 6th class and girls from 5th class playing alongside with children from Ballindaggin and Caim national schools. The boy’s football final against Davidstown takes place tomorrow Friday 18th in St Patrick’s Park, Enniscorthy at 3:30pm. Players are asked to arrive no later than 3:15pm. I’m sure the team would appreciate as much support as possible. 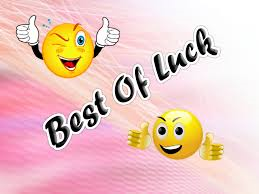 The girl’s football final against Ramsgrange will take place next Monday the 21st at 3:30 pm in Taghmon GAA grounds. All players are expected to be there for 3:00pm, and once again we hope to see as much support as possible. We wish both teams the very best of luck in their finals. They have worked extremely hard to get this far and well done to all involved. We also wish to thank the parents who take the time to bring their children to training and matches. 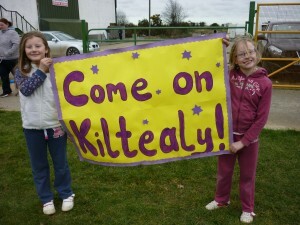 You can view news, results and fixtures for the Rackard League at www.rackardleague.com.